CYCLONES Female Hockey Events Coming Up! The banquet will be at the Coast Terrace Inn, catered by LA Chefs, and offers an opportunity for women to connect through sport (each host ticket purchased will also include a “guest” ticket, where a young female, between 8-18 years, can join the host for the banquet). Proceeds from the event will support the Lethbridge Cyclones Female Hockey program. KPMG is a proud sponsor of this event. 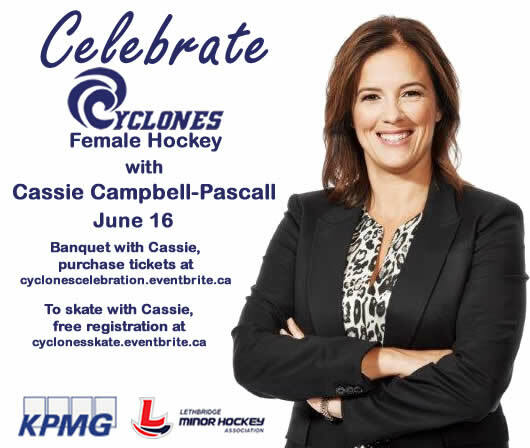 We are also offering come skate with Cassie sessions on June 16, 2018 for FREE for female athletes!